Driven in large part by political correctness and partisan academics and activists, it has become fashionable in recent years to criticize Christopher Columbus and the holiday named in his honor. A closer look, however, reveals the famed explorer to be a man of faith and courage, not a monster. Many of Columbus’ modern critics rely on a warped and politicized reading of history, and it is not the first time the explorer has endured such attacks. When a resurgence of anti-Catholic bigotry erupted in early 20th-century America, Columbus was a favorite target then as well. Despite animus among some groups today, the majority of Americans view the explorer positively and with pride. 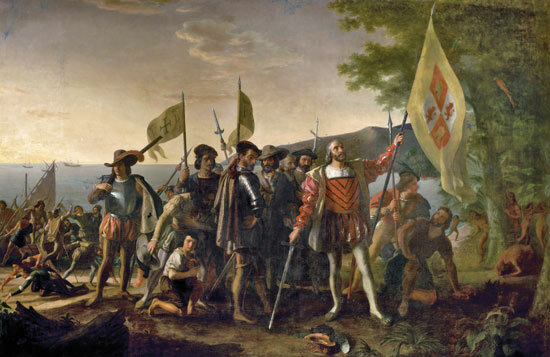 In a K of C-Marist poll from December 2016, 62 percent of Americans expressed a favorable opinion of the explorer and 55 percent said they were in favor of Columbus Day, the holiday named for him. By contrast, fewer than 3 in 10 view Columbus unfavorably and only 37 percent oppose the holiday named for him. Nonetheless, there have been political efforts to strip Columbus of honor, and the question of whether to continue to recognize Columbus Day is under review in many places. Some states and municipalities have removed the explorer’s name from the holiday or eliminated the observance entirely. Unfair attacks on Columbus, past and present, should not be allowed to obscure the truth about the man, his voyage and his motives. Born in Genoa, Italy, Columbus was a deeply Catholic explorer who was willing to go against the grain. He believed he could reach the shores of Asia by sailing a mere 3,000 miles west across the Atlantic. Such a passage would establish faster and easier trade routes than were possible through overland travel or by sailing south and east around Africa. Scholars of his day calculated the distance to the Orient across the Atlantic at well over 7,000 miles, out of practical range for ships of the day. Those who were skeptical of the admiral’s proposal did not hold that the earth was flat, as popular myth has suggested, but rather that it was much larger than Columbus believed. Despite his miscalculation, after 10 weeks Columbus did indeed find land — not the outskirts of the Orient, as he went to his grave believing, but an entirely new continent. Later, as a nation began to coalesce out of the American colonies, its leaders recognized the admiral’s legacy. “Columbia” served as an informal name for what would become the United States of America. The eventual designation of the nation’s capital reflects the esteem the founders had for the Genoese explorer. Beginning in the 1840s, waves of European immigrants swelled the ranks of Catholics in the United States, and along with that came an increasingly anti-Catholic, anti-immigrant backlash from the Protestant majority. Catholics were subject to discrimination, slander, ridicule, anti-Catholic propaganda and sometimes mob violence. It was within this hostile climate that Father Michael J. McGivney founded the Knights of Columbus in 1882. He and the founding Knights chose as the Order’s patron Christopher Columbus — one of the few Catholics considered a hero of American history. Father McGivney believed the explorer represented both Catholicism and patriotism at the very root of America’s heritage, thereby symbolizing that faithful Catholics also can be solid American citizens. Colorado became the first state to establish Columbus Day in 1907, and others soon followed. In 1934, with strong urging and support by the Knights, President Franklin D. Roosevelt and Congress made Columbus Day a federal holiday, mandating its first annual observance on Oct. 12, 1937. 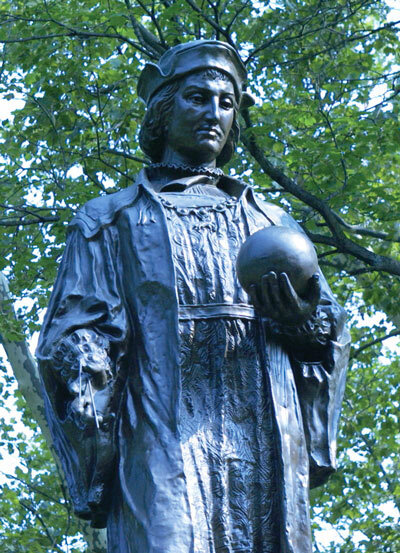 This statue of Christopher Columbus, dedicated by Italian-American residents in New Haven, Conn., was erected in 1892 in Wooster Square Park. In 2004, restoration of the statue was partially funded by the Knights of Columbus. Vandalized 2017. In response to one such initiative in Baltimore, Eugene F. Rivers III, founder and president of the Seymour Institute for Black Church and Policy Studies, published an op-ed article Dec. 2, 2016. The 20th century ended with criticism of Columbus and Columbus Day in certain quarters, just as the early 20th century had seen similar opposition. When the Ku Klux Klan was revived in 1915 and targeted Catholics, Jews and minority groups whom they considered a threat to the nation’s “Native, White, Protestant” identity, one of their targets was Columbus. The Klan opposed the observance of Columbus Day, trying to suppress celebrations of the holiday at the state level. Klan members published articles calling Columbus Day a “papal fraud” and even burned a cross at a Knights of Columbus observance in Pennsylvania. Today, one can still hear echoes of anti-Catholic prejudice in the modern attacks. For some, Columbus’ sponsorship by Spain and introduction of Christianity and Western culture to the lands he discovered make him immediately suspect. The new wave of anti-Columbus attacks go so far as to say that Columbus intended nothing good. “These criticisms primarily charge Columbus with perpetrating acts of genocide, slavery, ‘ecocide,’ and oppression,” explained Robert Royal, president of the Faith and Reason Institute and author of 1492 and All That: Political Manipulations of History (1992). Nonetheless, a closer examination of the record reveals a different picture. In a 2012 Columbia interview, Delaney further explained that Columbus found the native peoples to be “very intelligent” and his relations with them “tended to be benign.” He gave strict instructions to the settlers to “treat the native people with respect,” though some of his men rebelled and disobeyed his orders, particularly during his long absences, Delaney added. Columbus’ voyage made the Old and New Worlds aware of each other for the first time, eventually leading to the founding of new countries in the Western Hemisphere. Diseases inadvertently carried to the New World by the Europeans caused the greatest number of casualties by far, killing some 90 percent of native populations according to some estimates. According to Royal, arguments against Columbus by modern critics often constitute a “new, contemporary form of the ‘Black Legend’” — anti-Spanish propaganda dating back to the 16th-century that stereotypes Spanish explorers as uniquely cruel and abusive. The writings of Bartolomé de las Casas — a 16th-century Spanish Dominican priest, historian and missionary — exposing the abuse of the native peoples are often cited in an effort to impugn Columbus. But while de las Casas lamented the suffering of indigenous people, he also admired and respected Columbus for his “sweetness and benignity” of character, his deep faith and his accomplishments. The Knights of Columbus has defended its patron from unfair attacks, urging that he continue to receive official recognition as a man of faith and bravery. Columbus represents the kind of heroic courage and religious faith that inspired the establishment of the United States. Although he surely holds special meaning for Catholics and for Italian Americans, Columbus is a figure all citizens of the New World can celebrate. GERALD KORSON writes from Fort Wayne, Ind.